Now that most of the major pieces are in place as far as free agency goes in the NFL, it has become a bit easier to make projections with a realistic idea of what each team needs. There are some pending situations with franchise-tagged players and restricted free agents that need to be resolved, but in general things are more-or-less in place. One adjustment that I will need to make on my next 2012 NFL Draft mock update is with Philadelphia. With the Eagles trading a 2012 fourth-round pick to Houston for MLB DeMeco Ryans (a misfit in Houston's new 3-4 defense last season), they filled a huge need and knocked a popular projection off the board: Philadelphia drafting Boston College MLB Luke Kuechly at #15 overall. Ryans had a monster first four years for the Texans (including a monster 125 tackle campaign as a rookie in 2006), but played in only six games in 2010 and then found himself as a poor fit in Wade Phillips' 3-4 set. That's not a knock on Ryans -- it's just the reality that some guys fit certain sets better than others. Jonathan Vilma was in a similar situation with the Jets when they switched to a 3-4, but they dealt him to the Saints prior to the 2008 season and Vilma quickly regained the strong form he showed when the Jets ran a 4-3 during his first two seasons in the NFL. Running backs have become less important than ever in the NFL. Those who regularly read my columns know that I've driven that point into the ground, but I do so because rule changes made for player safety reasons have made it significantly more advantageous to have a pass-heavy offense than it was in the past. The same is true for having a strong pass defense. It's a fundamental adjustment within the league that many casual fans aren't necessarily fully aware of at this juncture. Flashback to 2005, when three running backs were selected in the top five spots of the NFL Draft. Those days are long gone. It's interesting to look back at that draft and notice back-to-back 3-4 OLB prospects selected just outside of the top ten: Dallas drafted Troy OLB/DE DeMarcus Ware at #11 and San Diego drafted Maryland OLB/DE Shawn Merriman at #12. The NFL was in the opening stages of a transition phase at that point, though it wasn't obvious at the time to most. The timing worked out well for the Cowboys and the Chargers in that draft. Ware remains one of the elite 3-4 OLBs in the NFL, and Merriman had a monster first three seasons, earning a trio of Pro Bowl invites from 2005-2007 along with recording a combined 39� sacks in that timespan before sustaining multiple injuries that derailed his career. Seeing three running backs go before a single DE/OLB might appear almost laughable now with how the NFL is, but at the time it didn't seem out of place. Then the 2006 season arrived and the Colts and Bears met in Super Bowl 41 (XLI). Both teams utilized two-platoon RB attacks, finding success without relying on a primary running back. It didn't take long for the copycat NFL began to figure out that the value of any one particular running back was no longer as high as it once was. There are exceptions, of course. Minnesota drafted Oklahoma RB Adrian Peterson at #7 in 2007, and he has had a fantastic career thus far. In 2008, the late Al Davis didn't receive the usual post-draft heckling that had become a regularity for the Raiders at that point when his team selected Arkansas RB Darren McFadden at the #4 overall spot. I certainly didn't doubt McFadden's ability; I saw him tear up Mississippi State in person in 2007 at that dump of a stadium in Little Rock which the Razorbacks sometimes use for home games. McFadden has been plagued by injuries through the first four seasons of his NFL career, but when he's healthy: lookout. He has a 4.8 yards per carry career average in the NFL, which is a stunningly high number. In 2010 he averaged 5.2 yards per carry, and he topped that in 2011 with a mind-boggling 5.4 yards per carry. It makes me wonder what we'll see from him in 2012. NFL general managers tend to catch on to trends and changes in the game pretty quickly, and those who don't usually find themselves out of work just as fast. Over the past three drafts, only one running back has gone in the top ten: Clemson RB C.J. Spiller, who went to Buffalo at #9 in 2010. After an unremarkable rookie year, Spiller finally had a chance to show some of his lightning-quick speed last season when starting RB Fred Jackson fractured the fibula in his right leg and went on injured reserve. The jury is still out on Spiller at this point. Statistics can be misleading, but it's worth noting the number of NFL running backs that had 300 or more rushing attempts, by season, from 2000 to 2011. The player who posted the most regular-season carries in a given season is listed next to the year, along with how many carries the player had that season. The number of 300+ carry players last year would have been one if Michael Turner (301) had made two fewer carries. 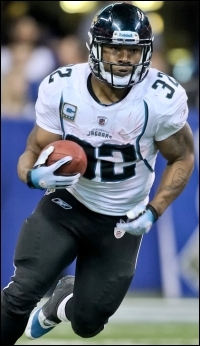 Maurice Jones-Drew posted a league-high 343 attempts in 2011, mostly out of need due to the quarterback and wide receiver situation in Jacksonville being so terrible. But notice the drop from 2006 to 2007 (after the Colts/Bears Super Bowl) and then the precipitous drop from 2010 to 2011 with the new player safety rules in effect. And, while there were anomolies in the past, like in 1993 where only two players had 300 or more carries, the drop from 2010 to 2011 came in large part as the result of rule changes. I suspect that there will be very few RBs in 2012 who end up with 300 or more regular-season carries. Larry Johnson's 416 carries in 2006 for Kansas City is the all-time single-season NFL record. Johnson held out in the summer of 2007 in an attempt to extract a new contract from the Chiefs. His holdout and subsequent negotiations for a new deal served as one of the storylines of the very entertaining 2007 season of HBO's Hard Knocks that featured the Kansas City Chiefs. The result? Johnson's holdout paid off, with him ultimately agreeing to a new contract which included $19 million guaranteed. In a related note, Johnson also never cracked 900 yards rushing in a season again. If someone tried holding out now after a 400+ carry season, I suspect that the player in question would be encouraged to sit at home and not come back until he was tired of being fined $30,000 a day, the new fine level for holdouts that went into effect in the new NFL CBA. I could add plenty of additional glowing comments about Richardson to the list, including Charley Casserly's assertion that Richardson is the number two overall prospect in the draft behind Andrew Luck, but I think you get the idea -- he is a tremendous running back with the potential to have a long, productive NFL career. I didn't exactly have to cherry-pick through evaluations to find the positive comments above. Richardson's 2011 season at Alabama was outstanding in almost every way: 5.9 yards per carry, 1,679 yards rushing, 24 total touchdowns, and 29 receptions for 338 yards. To have that kind of performance with Alabama's brutal SEC schedule, not to mention their trip to Penn State, is impressive. At 5'11" 225 pounds, he is in the ideal range for the size you'd like to have in a primary running back. So what happens next? We wait for Thursday, March 29, when Richardson is scheduled to hold a workout for interested NFL teams. Richardson opted not to work out at last month's NFL combine, nor did he work out at Alabama's pro day on March 7, as he was recovering from minor surgery on his left knee. World renowned orthopedist Dr. James Andrews described it like this: "[If] Trent had this scope done on his knee during the season, he'd have been playing within 10-to-14 days." If Richardson has an impressive workout, I will have to seriously reconsider projecting him to fall all the way to Cincinnati at #17. While that would be a tremendous turn of events for the Bengals, there are more and more signs that Richardson won't slip out of the top ten and that him going in the top five is a distinct possibility. Running backs may have less value than ever in the NFL, but a player with Richardson's talent might be able to become the exception to the rule and go to Cleveland at #4 or Tampa Bay at #5. We'll find out soon enough on that. With no known red flags, glowing reviews across the board, good pass receiving skills and exceptional talent that stood out on some of the largest stages in college football, Richardson appears primed to have a strong pro career regardless of which team ends up drafting him.